What happens when air, water, and metal meet? If you've ever seen a rusty old car rumble down the road, you know the result isn’t pretty. Just from exposure to water and air, the solid iron making up the body can crumble and buckle as corrosion takes over. This is a prime example of just how powerful the interactions among water, oxygen, and metals can be. As it turns out, these interactions have important consequences beyond just ruining the family station wagon. One of the most important places these effects show up is catalysis. Catalysts are used in industrial applications to speed up, ordinarily sluggish, chemical reactions. The production of fertilizers and plastics, as well as the refining of fossil fuels, depends on metal catalysts. Unfortunately, improving them remains a major scientific challenge. A key issue is that tiny changes at the surfaces of catalysts can dramatically alter their performance. This is exemplified in the case of gold catalysts. Gold, which is usually chemically inert, acts as a catalyst when oxygen atoms are stuck on its surface. This catalytic activity can jump even further with the addition of small amounts of water. In fact, water can increase the catalytic activity on gold surfaces by more than a factor of 100. To decipher what’s going on at these surfaces, scientists with the Integrated Mesoscale Architectures for Sustainable Catalysis (IMASC) Energy Frontier Research Center sought to probe the fundamental molecular interactions that occur on a gold catalyst by tracking the movement of individual oxygen atoms. With this system as a model for many other metal catalysts, the IMASC team used a combination of microscopy, isotope studies, and theoretical calculations to determine the effect water has on the surface and how this effect improves catalysis. At a microscopic level, oxygen sticks to gold surfaces in a process called adsorption. These adsorbed oxygen atoms clump together on the surface, forming small islands in a zigzag pattern. To see these features on the surface, the researchers utilized an ultra-high-resolution microscope, called a scanning tunneling microscope. This allowed them to not only find these islands but to pinpoint individual atoms within them. By measuring the changing sizes of these islands, the researchers determined how many oxygen atoms move on the surface which gives an idea of how mobile these atoms are. When water is absent from the surface, very few oxygen atoms move at 170 Kelvin (or around -150 degrees Fahrenheit). However, as water is added to the surface, the size of the islands fluctuates much more rapidly, indicating that oxygen atoms are much more mobile, dancing across the surface from island to island. The microscopic evidence demonstrated that water makes it easier for oxygen to move around on the surface -- but why? 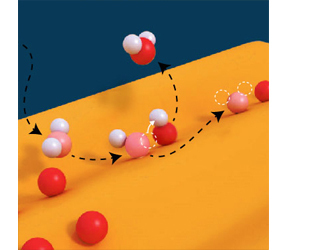 By using water with specifically labeled oxygen, the researchers sought to develop a more precise idea of what happens to individual molecules at the surface. They found that labeled oxygen, originating from water, exchanges with oxygen already adsorbed on the surface. This suggests that water molecules do not remain whole during the process of oxygen migration. Rather, water splits apart at some point, allowing its oxygen atom to adsorb onto the surface. The team then used a computational method called density functional theory to help determine which chemical transformations could fit with their experimental evidence. Computational results suggest that splitting water apart in the presence of surface-bound oxygen can occur with relative ease. This split forms two hydroxyl (OH) groups on the surface, and while oxygen binds very strongly to the surface, hydroxyl binds weakly. This evidence allowed the researchers to determine a step-by-step process, describing the movement of oxygen on the surface. The process starts as water approaches the gold surface. The water molecule is weakly attracted to oxygen atoms at island edges. When the water comes close enough to the oxygen, it splits to form two hydroxyl groups. These hydroxyl groups bind weakly to the surface, allowing them to move around much faster than oxygen atoms. The hydroxyls move around until they find another hydroxyl with which to combine. The recombination of the two hydroxyls leaves an oxygen atom on the surface, removing a water molecule in the process. 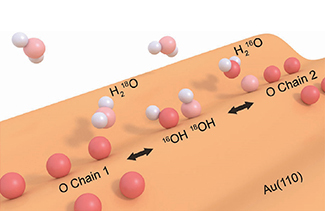 This step-by-step process fits with the experimental results, and it provides insights into the cooperative role water and oxygen play in catalysis at metal surfaces. From this mechanism, the increased catalytic activity in the presence of water can be attributed to two effects. First, the surface hydroxyls formed during migration are much more catalytically active than metallic gold and adsorbed oxygen. Second, the increased mobility of oxygen atoms keeps reactive oxygen atoms dispersed across the surface instead of aggregated in large islands. This analysis shows how important it is to understand precisely what’s happening at the surfaces of catalysts since even the smallest changes can dramatically increase catalytic activity. It also demonstrates the power of combining sensitive experimental techniques, such as microscopy, with theoretical modeling to learn about the physical world. This work was supported as part of the Integrated Mesoscale Architectures for Sustainable Catalysis (IMASC), an Energy Frontier Research Center funded by the Department of Energy, Office of Science, Basic Energy Sciences. When it comes to producing many of the essential products we use every day, catalysts make a big difference. A more efficient catalyst could lead to faster industrial production and less waste. A challenge in making better catalysts is knowing how they work in detail. Small details make a big difference. At the Integrated Mesoscale Architectures for Sustainable Catalysis (IMASC) Energy Frontier Research Center, scientists uncovered one such detail: the step-by-step dance of oxygen atoms across a gold catalyst’s surface. Oxygen, which makes gold active as a catalyst, usually grabs on tightly to the surface; however, in the presence of water, it can zip around much more quickly. Water transforms the surface oxygen into hydroxyl (oxygen + hydrogen) groups. These hydroxyls attach loosely to the surface, allowing them to glide across. This dance keeps reactive oxygen atoms dispersed across the gold surface, instead of clumped up in islands where they are less active. Such atomic-level knowledge of catalysts helps scientists write the design guide for creating better catalysts. Harvard University leads IMASC.